This past week I was entertaining some family friends and wanted to show them how easy it is to incorporate Cricket Flours and cricket protein into some of their favorite recipes. Because of cricket powders versatility in the kitchen it can be used as the main protein source or as an added flavor and ingredient to a great dish. 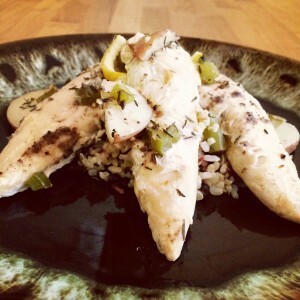 For this Cricket Flours Baked Lemon Chicken Recipe I decided to use ingredients such as cricket powder, chicken, green peppers, baby red potatoes, garlic, pepper, thyme, and fresh lemon to add a mix of summer ingredients for bright and tasty meal. We have provided the full list of ingredients below, but one of the best parts of this recipe is the ease of prepping and cooking this recipe. Simply add the ingredients below or your favorite assortment of vegetables to taste, lightly enclose in tin foil, and bake. It is that simple. Enjoy! Using a cutting board slice green peppers, baby red potatoes, and cut 1/2 of the lemon into small strips. Using two large sections of tinfoil create two separate pouches and evenly add in sliced vegetables, lemon strips, and minced garlic. Using the other 1/2 lemon squeeze fresh juice into each pouch but leave enough for a final garnish once the Cricket Flours Baked Lemon Chicken dish has finished cooking. Next add Cricket Flours: 100% Pure, salt and pepper to the top of the sliced vegetables and fruit. Place 4 chicken tenders on top of each mixture in the pouch and pinch together the top of each tin foil pouch to create a seal. Once removed from the oven, plate your meals and use the remainder of the lemon to add a final garnish of fresh lemon juice. Enjoy!